ALLEN PARK, Mich. (AP) — Matt Patricia wants the Detroit Lions to stay the course. The Lions have lost three games in a row — all by double digits — and are mired in last place. Their most recent defeat was an ugly one. Detroit fell behind 26-0 in the second quarter and eventually lost 34-22 at Chicago on Sunday. Patricia’s first season as coach has been a disappointment so far, and if he has any easy, quick fixes at his disposal, he wasn’t sharing them in his Monday news conference. Offensive lineman Taylor Decker sounded a similar refrain. The Lions (3-6) lost their first two games of the season, then fought back to a 3-3 mark before this current losing skid. They traded receiver Golden Tate before going on the road to face Minnesota and Chicago, and Detroit never led in either of those games. The past two games have been particularly rough from a pass protection standpoint. Detroit allowed 10 sacks against the Vikings and six against the Bears. So now the Lions are back where they were after those first two losses — playing catch-up. Only now, they don’t have a long season still in front of them. Detroit’s next three games are at home, but all are against teams with winning records in Carolina, Chicago and the Los Angeles Rams. 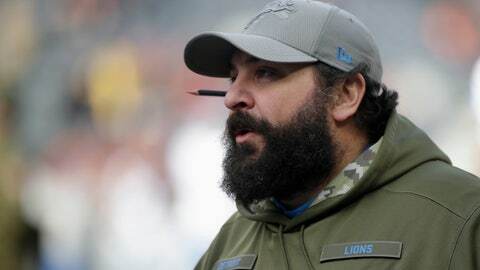 The Lions fired special teams coordinator Joe Marciano last week, but Patricia indicated no more staff changes are imminent. He said communication between him and the players is good. “I think we understand (that) we’re working hard to try to get everything the right way. There’s not a big discussion about it, there’s not a big confrontation or anything like that. I don’t know where any of that really comes from outside the building,” Patricia said. Detroit went 9-7 last season and then fired coach Jim Caldwell, so that makes the decline in 2018 even more alarming. Quarterback Matthew Stafford turned 30 earlier this year, and although the Lions traded Tate — a potential free agent at season’s end — for a draft pick, this franchise doesn’t seem as if it’s in a rebuilding mode. That means the rest of this season is significant. Whether they make the playoffs or not, the Lions need to show some progress — some reason for fans to trust that this roster and this coach are better than what the team has shown so far. NOTES: P Sam Martin didn’t go into much detail about the medical issue that sent him to the hospital, other than to say he’s fine and will play this coming weekend. He said he got blocked during a return Sunday. … The Lions waived CB Lenzy Pipkins.